Dublin City Council estimates 100km of cycle track it is planning could cost as much as €80 million – but according to the councillor behind DublinBikes the spend is “well worth the investment”. 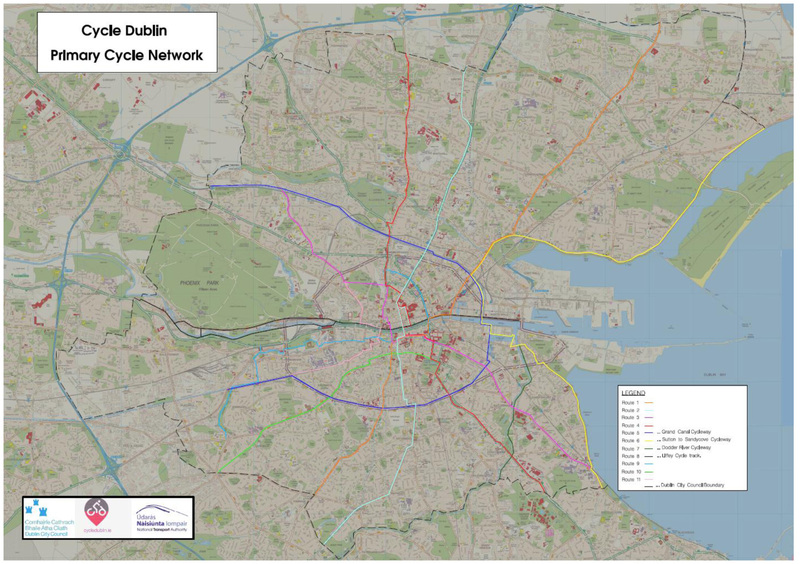 The upgrade of primary cycle routes is linked to the National Transport Authority’s draft Cycle Network Plan for the Greater Dublin Area. Cllr Andrew Montague said the price tag represents “good value for money” and “a good long term investment” compared to the estimated Luas Cross City construction cost of €368 million for the 6km of a tram route extension, which is expected to carry far fewer people than the cycling network. As it stands, more commuters who are city council area residents hop on their bicycles than take the Luas or Dart combined. The 2011 Census recorded nearly 23,300 city residents who said they mainly cycled to work or education, while less than 18,200 mainly choose any rail-based public transport. The city council is one of the seven local authorities in the area covered by the cycle network plan which includes counties Dublin, Meath, Kildare, and Wicklow. As we reported already, no funding estimates or time frames are included in the plan as these are “to be addressed as part of a separate investment funding process.” However the Dublin City estimated was reviled to councillors at a traffic and transport committee meeting last week. “It’s a pretty major investment to look at us doing about 100km of cycle track. You’re looking at a potential expenditure in the region €70 – €80 million if all the projects we’re looking at doing get accepted for National Transport Authority (NTA) funding,” said Brendan O’Brien, head of technical services of the roads and traffic department at the council. The council are currently in the process of setting out their priority a 5-year programme for cycling projects and this will feed into the NTA funding programme. “You’re talking about spending €70-€80 million, but we’re about to spend about to €350 million on Luas and we won’t get as many passengers as we would get if we get this 25% on bikes,” added Montague. “It’s good value for money, well worth the investment and a good long term investment,” he said. How long is it actually going to take for all this to happen. They could at least finish off the Sutton to Clontarf section of the Sutton to Sandycove route as a start as most of it is finished anyway save for the section between Dollymount Bridge and the Causeway on James Larkin Road. I would just love to see a route from the Phoenix Park along the Quays to the Point Depot the O2,it would be very handy with no Motor Traffic on it. They should do a proper job of the Grand Canal route from Portobello Harbour up to the Nass Road. They actually built the present Cycleway on the wrong side as it could have just kept to the one side all the way to Inchicore. Now at the Harolds cross secteion it will have to continue on the opposite side.